Notes: This shape is derived from early Ming prototypes usually painted with dragons on the circular body. Compare with two examples, the first illustrated in Chinese Porcelain: The S.C. Ko Tianminlou Collection, 1987, pl. 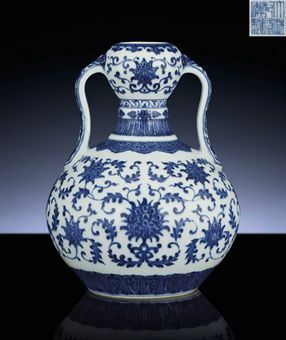 65; and a flask sold at Sotheby's Hong Kong, 2 May 2005, lot 650. 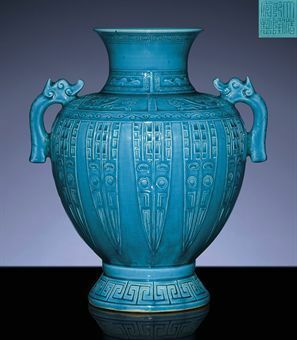 Compare also two related moonflasks of this same form but the first decorated a full-faced dragon within a medallion, illustrated in Blue and White Porcelain with Underglaze Red (III), The Complete Collection of Treasures of the Palace Museum, Commercial Press, 2000, p. 146, no. 132; and another designed with confronted dragon and phoenix within a medallion was sold at Sotheby's Hong Kong, 2 May 2005, lot 510. 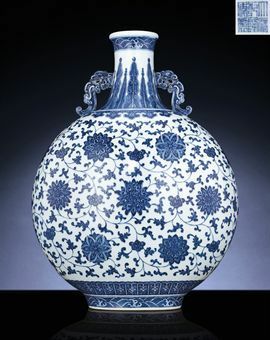 Vases of this type were recorded in the Qianlong Jishi Dang, 'A Record of Qianlong's Memorandum' where is is mentioned that in the third year of Qianlong (1738), a number of 'Imperial Xuande large blue and white moonflasks' were reproduced for palace decoration, ibid., 2000, p. 146.